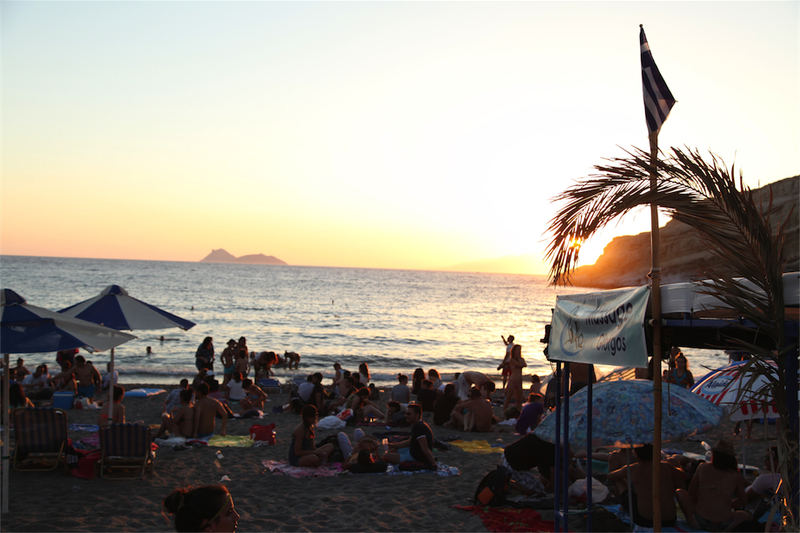 Matala 11K is a fantastic opportunity to discover a legendary location like Matala, a small village located 75 km south-west of Heraklion, Crete. Well known for its artificial caves (created in the Neolithic Age) that were occupied by hippies during the 60s. 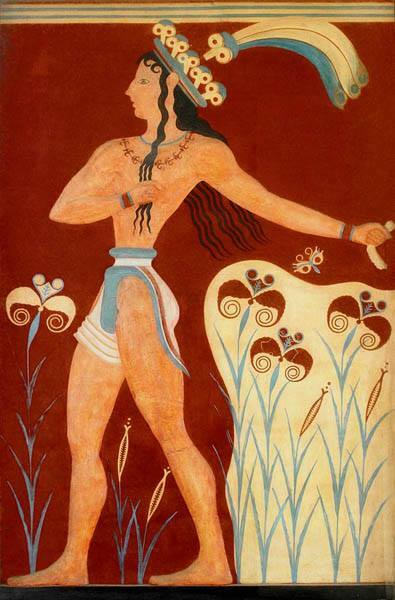 During the Minoan period was the port of Phaistos, while now it is one of the main touristic attractions in Crete. 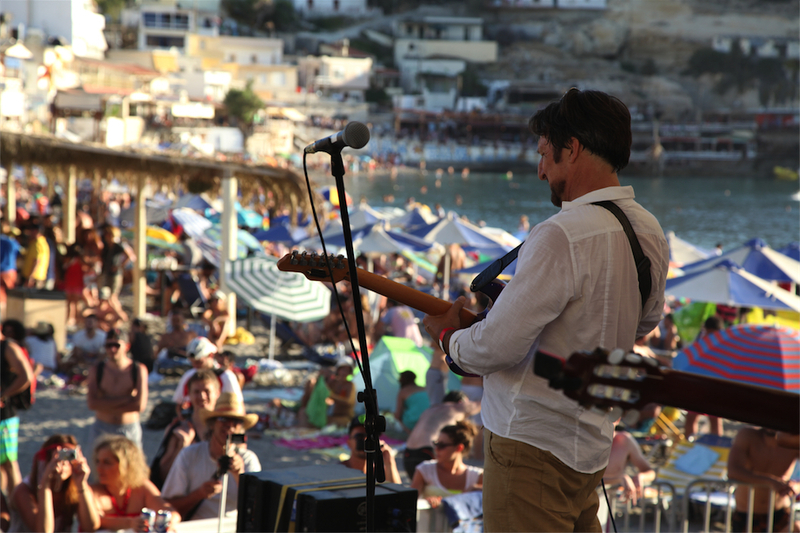 Combine running and enjoying the tranquility of Matala Beach at the “Matala Beach Festival” that will take place from 20 till 22 of June 2014. 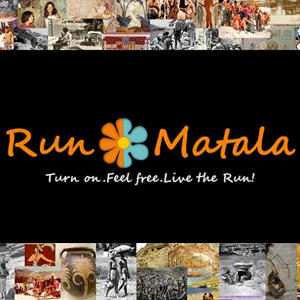 Welcome to the 11K Matala Run, a unique event in a legendary location. A 11K run and 3.5K run. All runs are finishing in Matala beach where the sea will wait to refresh you..
Matala, a small village 75K from Herakleion, a culturally unique heritage and a wonderful beach that continues to attract visitors of all ages. 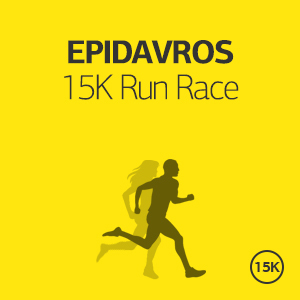 Because runners will enjoy an exciting route in a legendary location starting from the Archeological site of Phaistos and finishing in the beach of Matala. 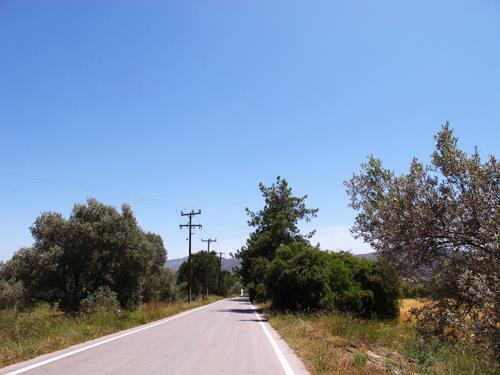 The route goes through the picturesque villages of Ag.Ioannis, Kamilaris, Pitsidia towards the Matala sandy beach and it is considered an easy route. We offer several options varying from short weekend breaks in Matala, Crete including your entry to the race, to a full vacation plan in Matala/Crete and the surrounding area! 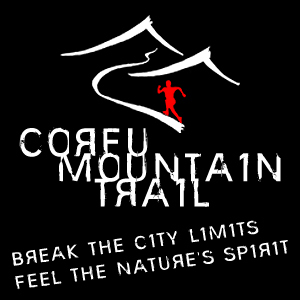 Moreover, we can offer you training plans, actual training in the streets and routes of Crete and of course we will run with you! Your participation to the race is secured by RunninGreece. Registration is open until Thursday, 12th of June 2014. Participation can be obtained via online registration. 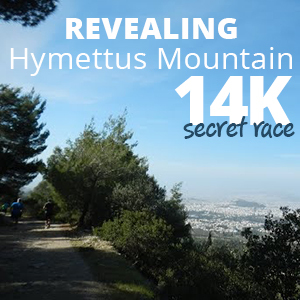 The race starts from the Archeological site of Phaistos and finishing in the beach of Matala. The route goes through the picturesque villages of Ag.Ioannis, Kamilaris, Pitsidia towards the Matala sandy beach and it is considered an easy route. In any case all runners participate solely at their own risk. The organizers or RunninGreece have no responsibility for whatever happens to the runners related to health issues or is due to lack of preventive medical check. It is highly recommended that the participants undergo a thorough medical examination before entering the race. The organizers will not ask for medical certificates from any athlete (male and female), since they all participate at their own exclusive risk and responsibility (children are at the liability of their parents or guardians). We will also provide offers for special health checkup for all runners, and members of their families. Along the route of the 11K and the race of 3.5K km will be stations to support the runners. At the start and finish stations and at the support stations of the runners bottled water will be available to all attendees. Medal and diploma are awarded to each of the first three winners of the general classification Men and Women at the race of 11K. 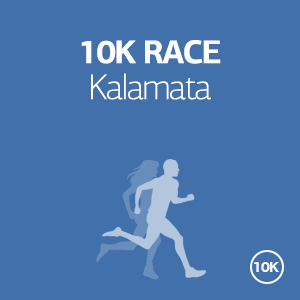 To all the runners who will finish the race a commemorative medal and a diploma of participation will be given. It starts from €50 per person (runner or not) for one night accommodation in a 4star or equivalent hotel. If you wish to stay longer, you may add as many nights as you want for an additional €30 per night per person. It starts from €100 per person (runner or not) for a three days/two-nights accommodation in a 4star or equivalent hotel. If you wish to stay longer, you may add as many nights as you want for an additional €30 per night per person. Please tell us all your requirements and preferences, how many days you want to spend in Crete, what other places you wish to visit and we will come back with a tailor-made offer specific for you! We can add trainings, running tours, car/bike rental, excursions, family activities and many more. In any case our offer will include the starting pack, commemorative diploma for participation, commemorative t-shirt, hotel arrangements, transportation to and from your hotel, participation to the race and all the logistics of the race entry, transportation to and from the starting line, tips and advice for the specific race, training schedule depending on your personal targets, safe keeping of your belonging during the race and suggested vacation plan for all the days that you will be in Crete. If you are a group of people, please tell us all your requirements, how many of you are running, what you like and what you do not like and we will come back with a tailor-made offer specific for you and your company! We can add trainings, running tours, car/bike rental, excursions, family activities and many more. In any case our offer will include the starting pack, commemorative diploma for participation, commemorative t-shirt, hotel arrangements, transportation to and from your hotel, participation to the race and all the logistics of the race entry, transportation to and from the starting line, tips and advice for the specific race, training schedule depending on your personal targets, safe keeping of your belonging during the race and suggested vacation plan for all the days that you will be in Crete. Matala combines a unique and compelling heritage, ancient and modern history and a superb natural landscape. 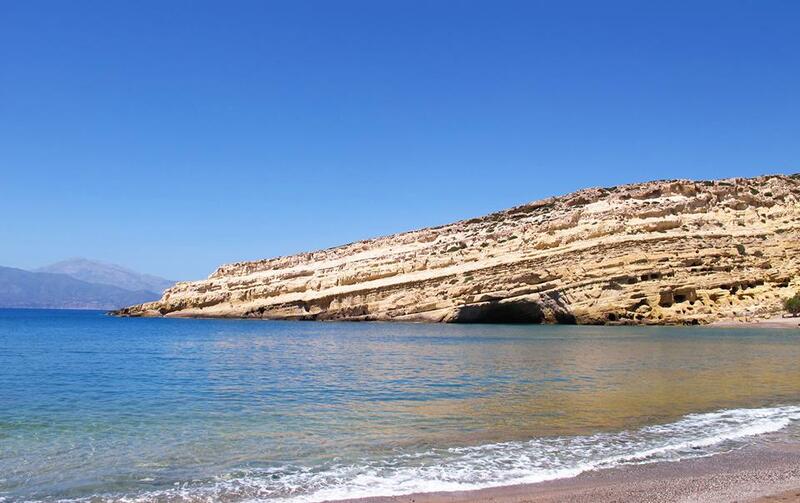 It is also conveniently located between Herakleion and Rethymno (two of the most important cities of Crete) and in the south coast of Crete and maybe the most beautiful one. 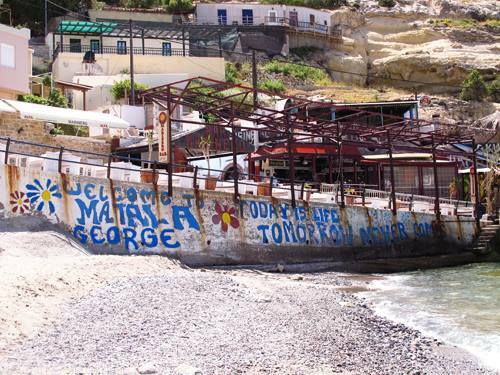 Matala was once the place of the flower-power and the hippy-scene and there are still signs of that era like the “Today is life, tomorrow never comes!" It is now one of the most important tourist attractions in Crete with many hotels, apartments, rooms, taverns and shops. The beach of this bay, in the form of a reaping-hook, is still the same turquoise blue sea, while the red disk of the sun which sets in the evening horizon generates amazing pictures. 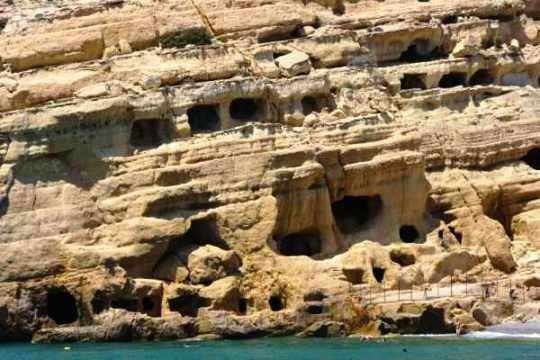 The cave houses, cut by the Cretan people from the early Stone Age, with their passages, stone beds and fireplaces, are now put under monumental care. A place full of history as well since it was the ancient port of Phaistos and Gortys and a former fishing community which has developed into a modern holiday center. Matala was the port of Phaistos during the Minoan period, following the destruction of Kommos, and the port of Gortys during the Roman period when Gortys was proclaimed capital of Crete by the Romans. A little further afield by car, north of Matala Bay, the archaeological site of Kommos offers Minoan ruins. You are also close to Phaistos and the Roman city of Gortyn. All of this is just one of the thousand reasons that you have to visit Crete and lose yourself on this relaxing area of the world. 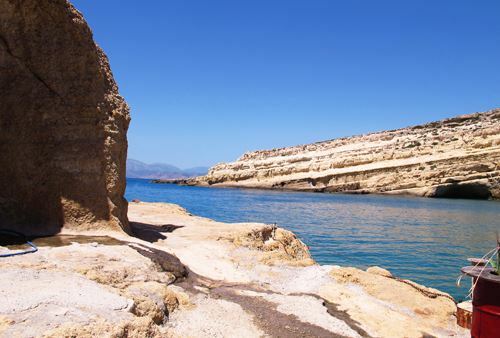 Especially, the lower coast of Crete, which is also the southernmost frontier of Europe, has so far managed to escape the tidal wave of tourism that has engulfed the north of the island. This is where you can sense an older, truer, more timeless Crete. The mountains seem more imposing and barren; the villages seem smaller and lazier. And in the bright sunlight, the contrasts of the island seem starker.